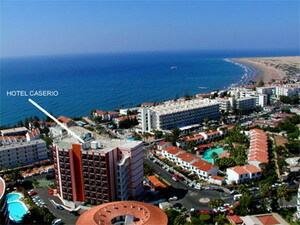 The Hotel Caserio is a modern hotel situated 50 meters from the shops and 300 meters from the beach. Aquasur Water Park is four kilometers away, Palmitos Botanical Park is 10 kilometers away, and the island's capital, Las Palmas, is 54 kilometers away. 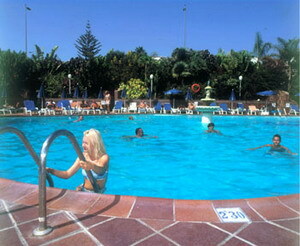 Gran Canaria Airport is 30 kilometers from the hotel, a 20 minute taxi ride. 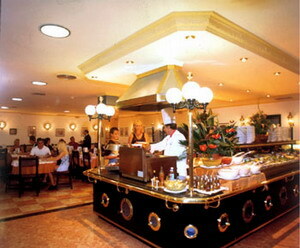 The main hotel restaurant serves a hot and cold buffet, with regular themed menus. 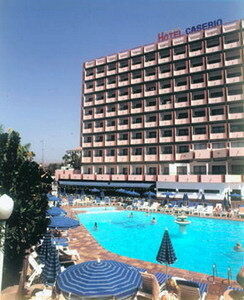 The outdoor swimming pool has an integrated children's section, while the sun area has a poolside bar for snacks and barbecues during the day and cocktails at night, as well as hosting live music and shows. Games from pool and table tennis to darts and chess keep visitors entertained, as well as a small playground for the kids. 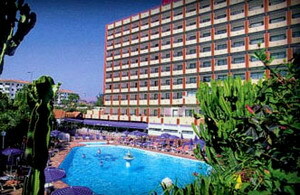 The reception is open 24 hours and the hotel also has a souvenir shop, and beauty salon with sauna and massage. Within the area, guests can enjoy a wide range of recreational activities including surfing, waterskiing, golf and horse-riding. The 176 guestrooms are decorated in light colors and all have their own balconies, many with sea views. All rooms have full bathrooms with hairdryers, shampoo and shower gel, and include telephones, satellite television, minibars, safety deposit boxes, piped music and air conditioning. Las Palmas - 54 Km.